*All shovel details, pricing, and descriptions follow below after general photo listings. Full-size, classically-styled shovel combining polished chrome-plated metal with lacquered ash wood construction. Available with personalized plates or lasered copy on the wood. SIZE : 40" long. Shovel head: 8 1/2" x 10 3/4". COPYAREA : 4" x 1 1/2" plate. PACKAGING : Corrugated box with bubble wrap. MATERIALS : Wood, chrome plated metal. SET-UP : $80.00 for logo and $50.00 for straight-line copy. Plate charge for screen printing is $20.00 per unit. Plate charge for laser engraving is $25.00 per unit. Additional colors available for screen printing, $70.00 second set-up charge, $4.00 running charge per color per plate. PERSONALIZED NAMES LASER-ENGRAVED PLATES : $15.00 per name in addition to applicable plate and running charges. AVAILABLE STYLES FOR LASER-ENGRAVED PLATES : Black plates w/silver copy or silver plates w/black copy. BLANK PLATES : $5.00 ea. OPTIONAL LASER-ENGRAVED COPY ON WOOD SHAFT : Set-up, $120.00. Running charge $35.00 ea. Copy area is 6" x 1 1/2". Packaging: Shovel is poly bagged, put in polyfoam then boxed. ; Units/Ctn: 1; Weight/Ctn: 6 lbs. A Groundbreaking Ceremony is certainly a one of a kind event. In attendance there may be dignitaries, architects, bankers, investors, tenants and many others that are a part of the whole project. 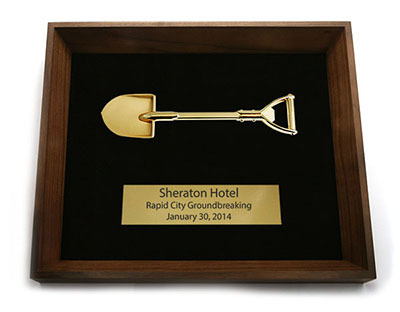 A Ceremonial Shovel is the perfect gift for one and all to remember this special event. SIZE : 38" tall. COPY AREA : 6" x 1" plate PRODUCTION TIME : Blank: 2 - 5 days (Custom Plate -8 -12 days.) CALL PACKAGING : Corrugated box with bubble wrap. MATERIALS : Wood, Gold or silver plated metal. CUSTOM PLATE: Plate lies flat on flat recessed area: PLATE: Add $35 ea (inc one color plate, screen & 1 color printing). COPYAREA : Spade: 6" x 3.5"; Plate: 4" x 1.25"
MATERIALS : Wood, stainless steel metal. Packaging: Shovel is poly bagged, put in polyfoam then boxed. ; Units/Ctn: 1; Weight/Ctn: 8 lbs. 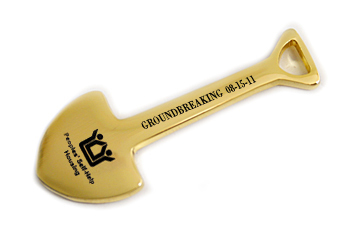 This item is the perfect way to commemorate groundbreaking ceremonies, and makes a great gift for any member involved in the collaborative effort. Your thoughtfulness will certainly be recognized. 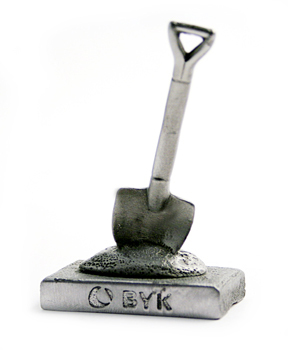 5.25" 3D miniature pewter cast shovel, with molded copy on the shovel head or handle. Recessed or raised copy. Pricing shown includes 1 location. COPY AREA: Handle: 2-1/2" x 3/16. Spade: 5/8"dia. 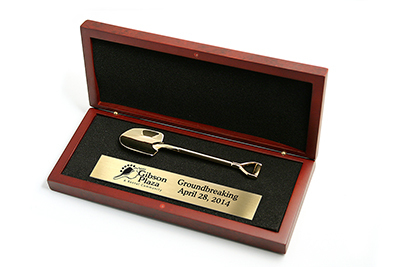 This item is the perfect way to commemorate groundbreaking ceremonies, and makes a great gift for any member involved in the collaborative effort. Your thoughtfulness will certainly be recognized. 6 3/4" 3D custom shovel replica, cast in a pewter alloy, with an antique silver finish or optional antique gold. This die cast shovel is electroplated in a rich, bright gold and then hand polished. The sandblast finish on the shovel head allows the sharpest details of your imprint to stand out in impressive fashion. 6.5" Die cast 3D shovel, polished and plated bright gold. Copy printed on the shovel head or shaft. Copy Area Head: 1 in. x 1 in. Shaft: 2 in. x 3/16 in. Price includes one-color imprint. IMPRINT : Up to two colors. SET-UP CHARGE : $80.00. For copy molded in one location. SECOND COLOR OR POSITION PRINTING : $80.00 set-up charge per color or position and $0.80 running charge per piece. PACKAGING : White folding gift box. OPTIONAL PACKAGING : 2-piece gift box $1.60 each. SAMPLE PROOF : $90.00 plus cost of item and setup, 6-8 working days. PRODUCTION TIME : 12-15 working days after proof approval. EXACT REPEAT : $50.00 re-setup. Commemorate and recognize those who participate in the project and those very special guests at the inauguration. This jewelry plated shovel on a custom base makes an elegant gift. Pewter Alloy Shovel in Antique Silver on Black Granite Cast Resin base with molded or printed copy. Optional molded copy available on shovel blade and/or shaft. Gold Shovel optionally available. SIZE : Overall size 6-1/4" x 3 1/2" x 2". PRODUCTION TIME : 10-12 working days after proof approval. COPYAREA : Base 2 3/4" x 3/4". Shovel 1 1/4" x 1". PACKAGING : White gift box. MATERIALS : Resin Base / Pewter Alloy Shovel. SET-UP CHARGE : $ 80.00 for one-color screen-printed copy on base. SET-UP CHARGE : $250.00 for molded copy on base, colorfilled w one color. Addnl color add $1.75 ea. OPTIONAL PERSONALIZATION ON SHOVEL : Molded copy on antique silver shovel add $80 set-up per position. OPTIONAL FINISH ON SHOVEL : For antique gold, add $1.60 ea. Commemorate and recognize those who participate in the project and those very special guests at the inauguration. This jewelry plated shovel on a custom base makes an elegant gift. Size 7 1/4 in. x 3 1/2 in. x 2 in. Copy Area 3 1/2 in. x 1 in. Product Detail Pricing shown includes a 1 color imprint. Call for rush service. Set-up Charge: $75.00 for screen printing $90.00 for laser engraving. Product Proof: $75.00 plus item cost , 5-7 days. Part Number NFSH-221 Die-cast shovel, floating in Lucite clear block. Printing on surface. Size 7 1/16 in. x 1 3/4 in. An elegant Rosewood-finished Presentation Box with 8" 3-D Die-cast Gold-plated Shovel, nestled in a custom-cut foam insert. 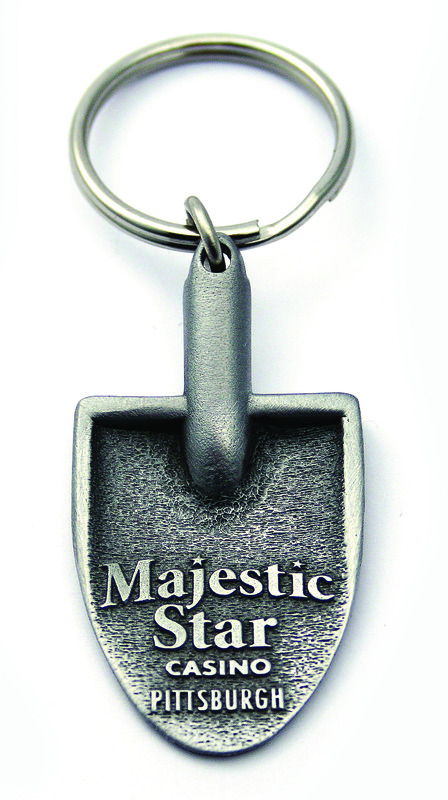 Personalization is available on a laser-engraved or printed plate. SIZE : Box: 10 1/4" x 7 1/2" x 3". PRODUCTION TIME : 5-8 business days. COPYAREA : 6" x 1" plate. MATERIALS : Rosewood finished box, gold plated shovel. PRINTED GOLD PLATE : $25.00 each. For an additional color add $3.00 ea. LASER-ENGRAVED PLATE (BLACK WITH GOLD COPY OR GOLD WITH BLACK COPY) : $25.00 each. SIZE : Either 6" x 1 1/2" or 3 1/2" x 3 1/4". RUNNING CHARGE : $25.00 ea. 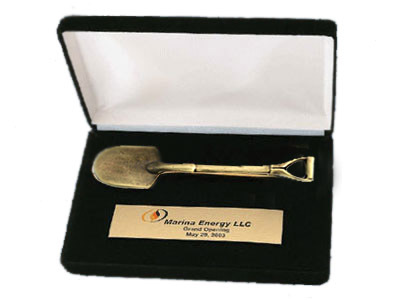 This die cast shovel is electroplated in a rich, bright gold and then hand polished. 3-D Die-cast Shovel Replica, polished & plated bright gold. Available with either one-color printing, multicolor or photo print 1" disc with epoxy dome, or blank. Part Number NFSH-225 Blank, 1 color, or full color on "sticker"
Copy Area Blank or Printed. MULTICOLOR OR PHOTO-PRINTED 1" DISC WITH CLEAR EPOXY DOME :$160.00 set-up and $0.80 running charge ea. Packaging STANDARD PACKAGING : Poly bag. WHITE FOLDING GIFT BOX : $0.80 ea. PRINTING ON BOX : $80.00 set-up and $0.50 running charge ea. Materials gold plated BLANK OR 1 COLOR IMPRINT SET-UP : $80.00 for one-color, one-location imprint. ADDITIONAL COLOR OR SIDE SET-UP : $$60.00 each side, with a $0.60 run charge per side and/or color, per piece. 50 pc minimum Send logo for quote. Size Box 6 in. x 4 in. Shovel: 5 1/4 in. Copy Area 3/4 in. x 4 in. on plate. Set-up Charge: $80.00 for screen printing or $90.00 for laser engraving. Second Color Printing: $60.00 set-up charge per color or position and $0.80 running charge per piece. Optional Packaging: 2-piece gift box $0.90 each. Product Proof: $80.00, 5-8 days. COPYAREA : Handle: 1-1/8"x 1". Blade: 2-1/2" x 1". MOLDED OR IMPRINT ON METAL : Set-up $80.00. Price includes one color imprint on one side. FOR SECOND COLOR OR SECOND SIDE : add $80.00 and $0.80 running charge per piece. STANDARD FINISH : Antique silver. OPTIONAL FINISH : Antique Gold, add $1.80 per piece. PACKAGING : Folding Gift Box. OPTIONAL PACKAGING : 2-pc cotton filled box $1.60 ea. SAMPLE PROOF : $90.00 , 6-8 working days. PRODUCTION TIME : 12-15 working days after proof approval. EXACT REPEAT : $40.00. Molds held for 2 years. COPYAREA : Handle: 1-1/8"x 1". Blade: 2-1/2" x 3/16". 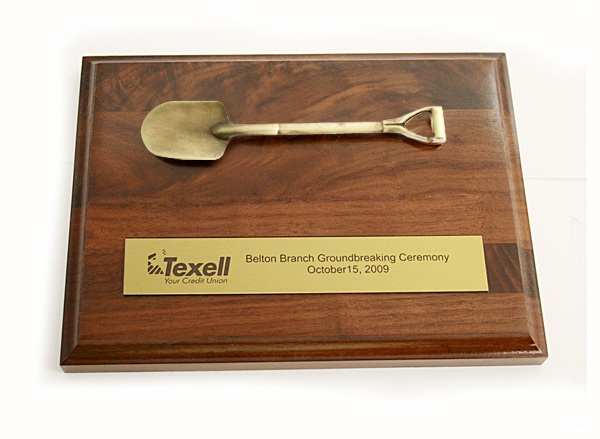 This multi-purpose item is the perfect way to commemorate groundbreaking ceremonies, and makes a great gift for any member involved in the collaborative effort. Your thoughtfulness will certain be recognized. Shovel Letter Opener with 3-D Cast Pewter Shovel Head and Die-cast Zinc Blade in an antique silver finish. Copy Area Handle: 1-1/8" x 1". Blade: 2-1/2" x 3/16". Product Detail FOR RUSH ORDER OR LARGE QUANTITIES CONTACT FACTORY. MOLDED SETUP : Set-up $80.00. For copy printed or molded in one location. FOR SECOND POSITION OR SECOND SIDE : add $80.00 and $0.80 running charge per piece, for printed copy. STANDARD FINISH : Antique silver. OPTIONAL FINISH : Antique Gold, add $1.80 per piece. PACKAGING : Folding Gift Box. OPTIONAL PACKAGING : 2-pc cotton filled box $1.60 ea. SAMPLE PROOF : $90.00 , 6-8 working days. PRODUCTION TIME : 12-15 working days after proof approval. EXACT REPEAT : $40.00. Molds held for 2 years. Commemorate and recognize those who participate in the project and those very special guests at the inauguration. 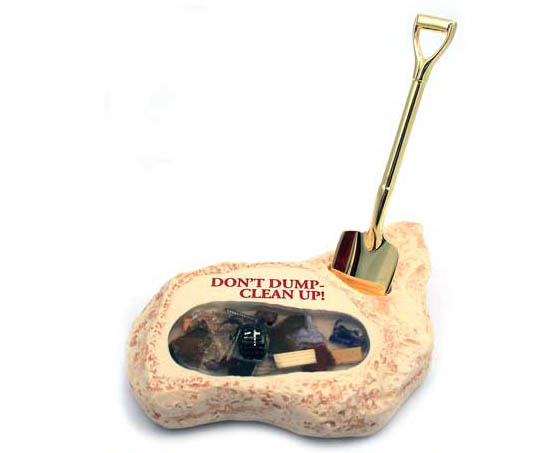 Our jewelry plated shovel on a custom base makes an elegant gift. 5 1/4" Shovel (available either blank or with molded imprint in antique silver or optional antique gold) inserted into Black Resin Boulder Rock Base. Rock available with screened or molded imprint. SIZE : 8" x 2 3/4" x 2 1/4". COPYAREA : 2" x 1 1/4" on the base. PACKAGING : White folding gift box. MATERIALS : Stonecast, antique finish metal shovel. FOR BLANK OR MOLDED SHOVEL : Antique silver is standard. For optional antique gold add $1.60 ea. SET-UP : $80.00 per copy location (either bowl of shovel or shaft). FOR MOLDED COPY ON STONECAST BOULDER : $250.00 mold charge includes one colorfill. Additional colorfills add $1.80 per color per pc. FOR SCREEN PRINTED COPY ON BOULDER : $80.00 set-up. OPTIONAL COLOR RUNNING CHARGE : 1.80 each and set-up of $80.00. Email your artwork and quantity (25 min) for pricing. SURFACE PRINTED ONLY Price to be updated soon. CALL US FOR PRICING!! CALL FOR CUSTOM PRICING ON THESE TWO NEW ITEMS! PRODUCTION TIME : 10-12 business days. PRINTING COPY AREA : 2 1/2" square. ADDITIONAL COLOR OR SIDE SET-UP : $80.00 each side, with a $0.90 run charge per side and/or color, per piece.